Ichilov Medical Tour is a medical tourism company offering medical treatments from a dozen leading Hospitals to patients from all around the world. It helps patients to find the right treatment, doctors, flights and accommodations. Ichilov Medical Tour was working with a handful of hospitals for which it had deployed an expensive keywords campaign in a competitive field directing traffic to over 5 main websites and more landing pages in several languages. The goal was to promote the service, engage potential customers and generate leads. Once leads were generated a team of representative was conducting a lengthy validation process and support in order to find the right treatment, doctors, flights and accommodations. They tried a LiveChat software to engage visitors online 24/7 and generate leads. In addition to the cost being too high, the LiveChat operators were most of the time not able to proactively engage visitors on the site - they were missing many opportunities. The challenge was to find a solution that enabled to engage a significantly higher number of visitors all day, all week, and generate more leads for their sales team – without adding much cost. Ichilov Medical Tour created chatbots for their websites in different languages. They were added first to landing pages, and later to all the websites in order to reach potential customers 24/7 and generate leads. With the help of VirtualSpirits support team, Ichilov Medical Tour adapted a simple yet effective sales speech to promote their service while at the same time provide answers to key sales question that visitors were asking. They added an outsourced team of human chat operators to intervene inside already active automated chats for specific high value segments. All leads including the entire chats were sent directly into the sales team's CRM, for qualification and nurturing process. Measured significant improvements in engagement, bounce rate, and time spent on site. 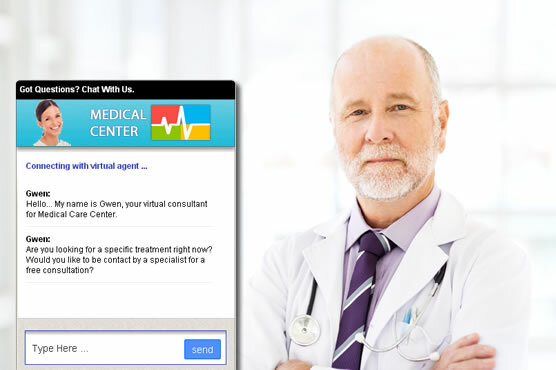 Ichilov Medical Tour has grown their operation since to a dozen leading Hospitals with over 40 websites and more landing pages all using VirtualSpirits chatbot.